Japan's foreign minister : North Korea is preparing for a nuclear test. Japanese - North Korean talks need to be cautious. In a speech held in the Japanese town of Kochi on March 31, foreign minister Kōno mentioned ongoing work at a North Korean nuclear test site where it seems that damage from an earlier test is being urgently repaired. 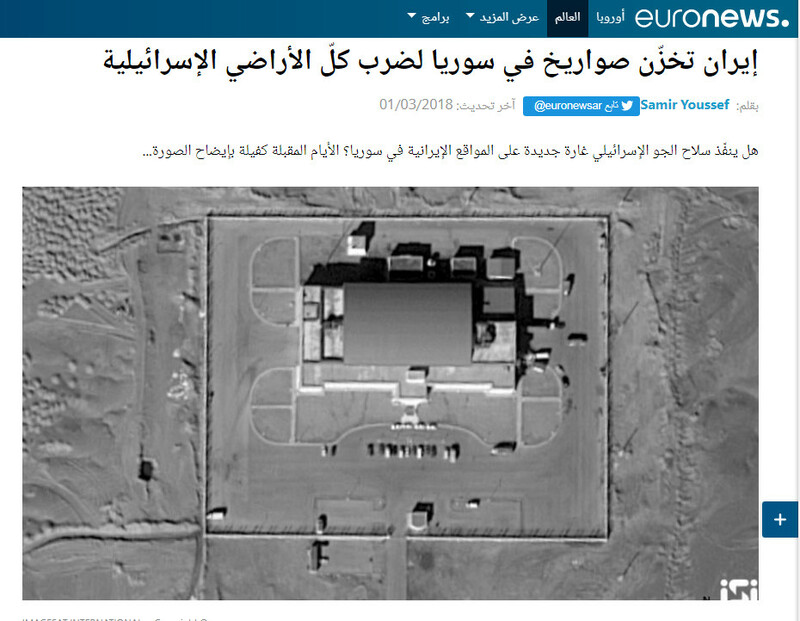 to satellite photos provided by the US. appeared above some nuclear sites in Iran. 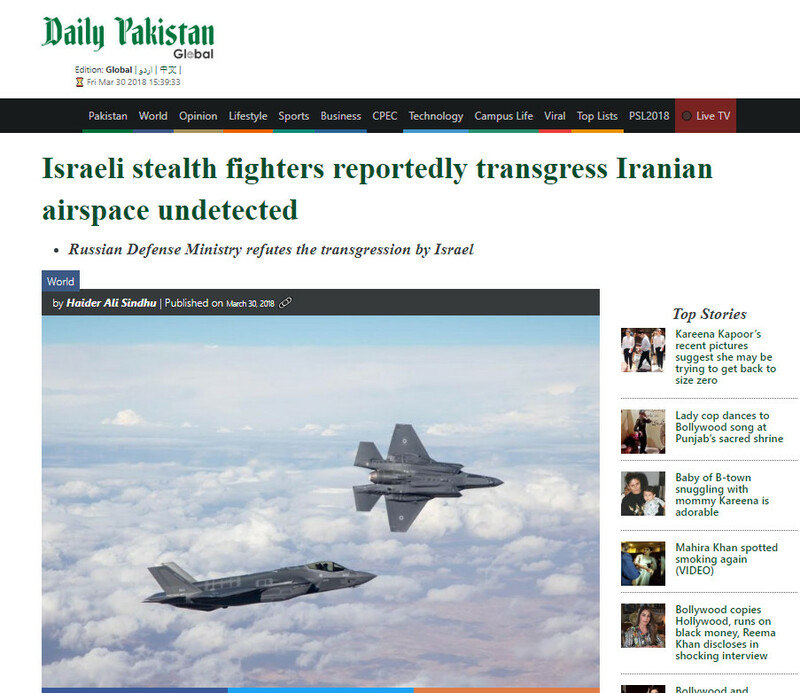 The Kuwaiti newspaper الجريدة الكويتية was the first to report on the incursion of two Israeli F35 stealth fighter jets into Iran where they allegedly circled high above sites that are considered to be linked with the Iranian nuclear program. The warplanes should have remained undetected by Russian radar facilities in Syria when they passed over Syria and Iraq on their way to Iran. This is being denied by the Russian ministry of defense. A comprehensive report on that incident has been published today by Daily Pakistan. 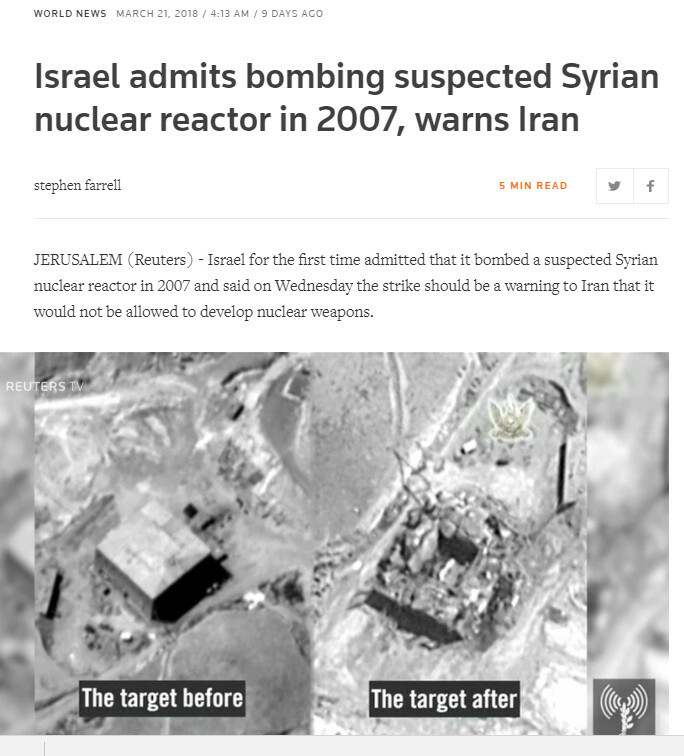 a Syrian nuclear reactor in 2007 as a warning to Iran. 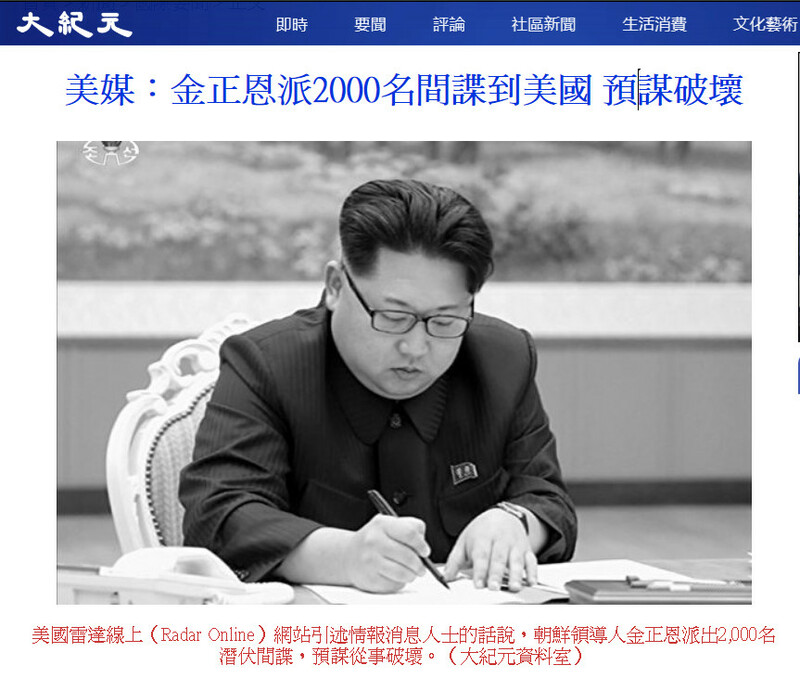 News are spreading that Kim Jong-un is on a secret visit to China. 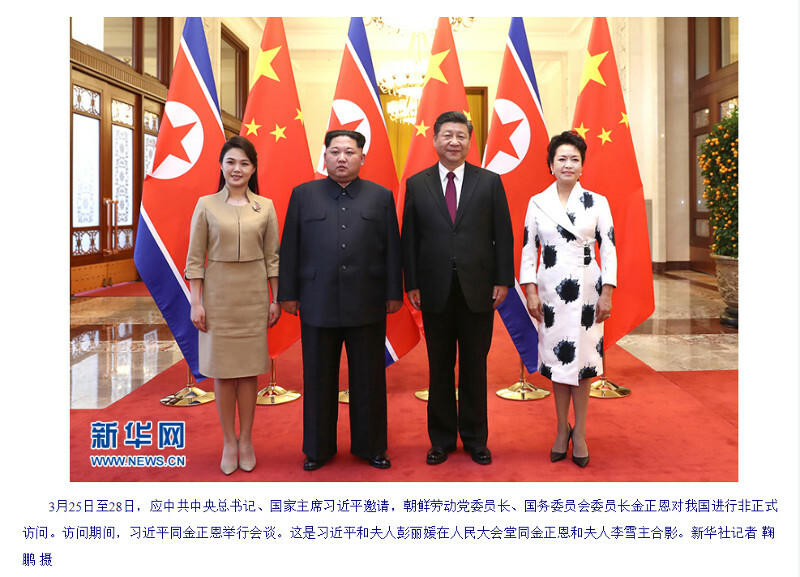 Beijing roads receive the distinguished guest. national guest house in Beijing and is meeting with Chinese leaders. It is said that Kim Jong-un arrived by train at Beijing's Dandong railway station around 22:00 in the evening. He is expected to stay in Beijing on an "unofficial visit" from March 25-28, 2018. North Korean motorcade leaving the national guest house early in the morning. the Great Hall of the People in Beijing. 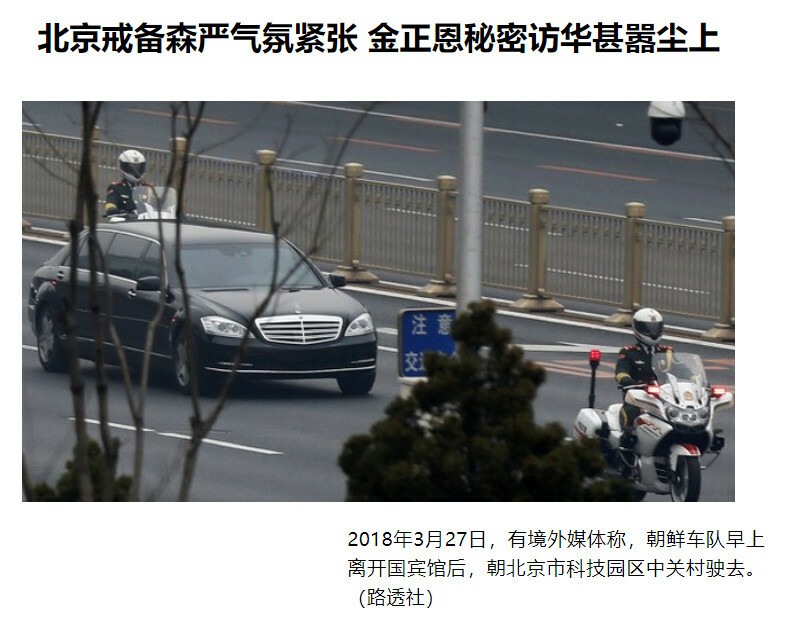 [XinHua 新华社 on March 28, 2018]. With secretive China trip, North Korea's Kim builds bargaining power. We hope for North Korea's political stability, the development of its economy and the happiness of its people. We support [our] comrade at the head of the commission to become the first in the North Korean Worker's Party to guide the North Korean people to continuously proceed along the road of socialism. We support the North Korean comrade in developing economy and improving the people's energetic efforts. 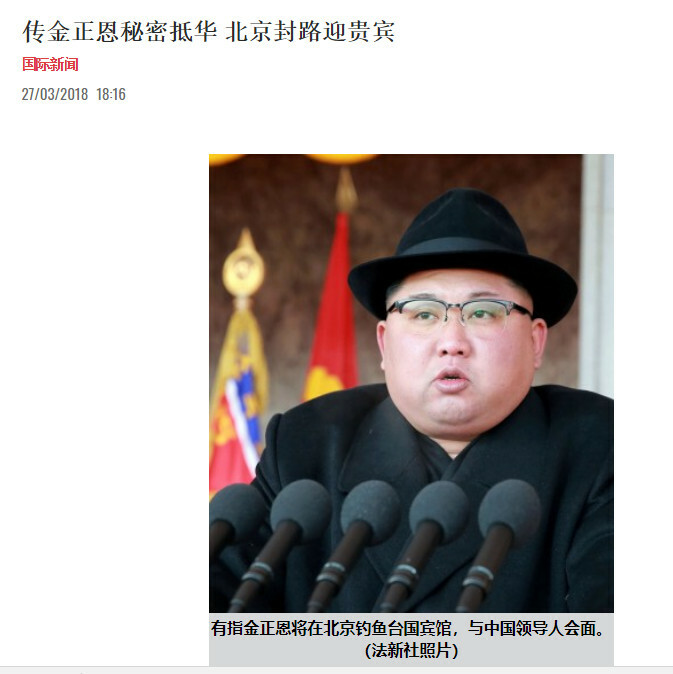 China's leader Xi JinPing quoted from People's Daily - overseas edition 人民日报海外版—海外网 on March 28, 2018. Chinese language TV station using material from Mainland China's Central TV CCTV. North Korea Is Firing Up a Reactor. That Could Upset Trump’s Talks With Kim. 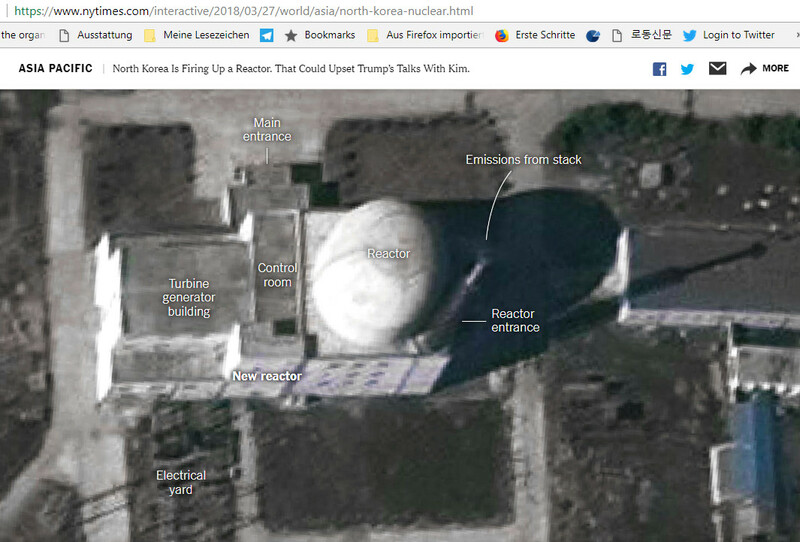 nuclear reactor in the Yongbyon area and that should be able to produce plutonium. the possibility of a summit with Japan and Russia. 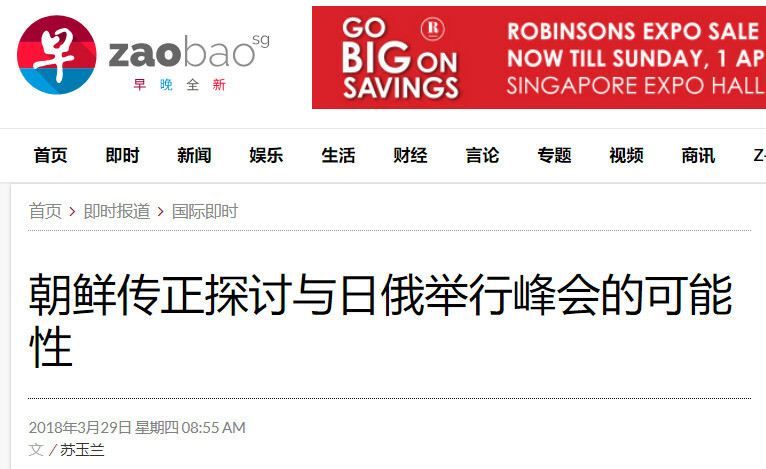 The headline from Singapore is referring to an article published by the Japan based "North Korean - Japanese News" from March 29.
personnel while waiting for his flight home at Kuala Lumpur airport in Malaysia. 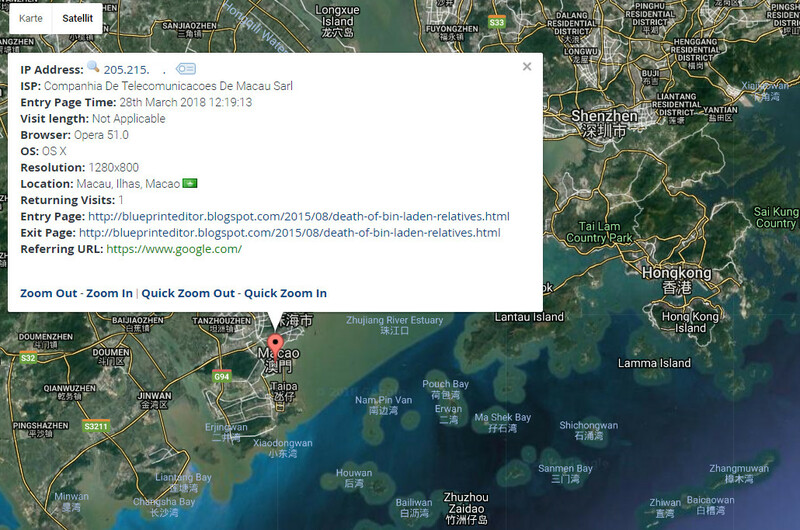 The assassination was allegedly staged on behalf of Kim's brother Kim Jong-un. in the first conversation after the declaration of his candidacy. Saif al-Islam al-Gaddafi : The son of deceased Libyan president Muamar al-Gaddafi striking in a manifold surprise and an intimidating aspect of manifold identities in the first conversation with him after his declaration of candidacy for Libya's presidency. Saif al-Islam al-Gaddafi is speaking. “Saif al-Islam Gaddafi, the son of the former Libyan president, enjoys the support of major tribes in Libya, so he can run for the upcoming presidential election due in 2018,” said Libyan Tribal Chief and spokesperson of the Gaddafi family, Basem al-Hashimi al-Soul to Egypt Today. “Saif al-Islam will run for the upcoming presidential election which may take place in mid-2018,” Soul revealed to Egypt Today in December. “Saif al-Islam plans to impose more security and stability, in accordance with the Libyan geography and in coordination with all Libyan factions,” Soul stated. The foreign ministers of Egypt, Tunisia and Algeria convened in Tunisia on Saturday to resume discussions over the security and political developments of Libya. Libya has become the largest security threat facing the Egyptian state, along with Tunisia and Algeria. 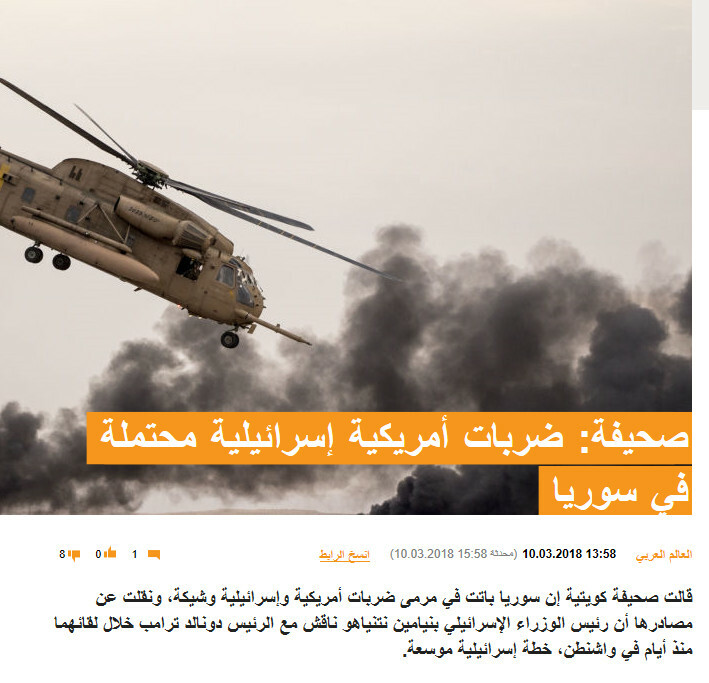 The frequent failures of international reconciliation attempts and the fall of weapons into the hands of different militant groups have forced Egypt to play a major role in seeking to solve the Libyan crisis. Previously, President Abdel Fatah al-Sisi met with Libya’s Chairman of the Presidential Council, Fayez al-Sarraj, to discuss the political accords necessary to preserve Libya’s unity and integrity. Now, Saif al-Islam al-Gaddafi is willing to make a statement in the frame of allegations that former French president Nicolas Sarkozy received money from his father, the toppled Libyan president Muamar al-Gaddafi, and which Sarkozy transferred to his party in order to finance his own election campaign in 2007.
quittant sa garde à vue mercredi 21 mars 2018.
leaving his custody on Wednesday March 21, 2018. Nicolas Sarkozy a été mis en examen mercredi soir dans le cadre de l'enquête sur le financement libyen présumé de sa campagne électorale de 2007. L'ex-président français nie les faits qui lui sont reprochés. Wednesday evening [i.e. March 21] Nicolas Sarkozy was interrogated in the frame of suspected financing of his 2007 election campaign by Libya. The former French president denies the accusations he is being reproached with. L'ancien chef de l'Etat, qui avait été placé en garde à vue mardi matin à Nanterre, a été mis en examen pour "corruption passive", "financement illégal de campagne électorale" et "recel de fonds publics libyens" et placé sous contrôle judiciaire, a précisé une source judiciaire. The former head of state had been put into custody and under legal control on Monday morning [i.e. March 19] and interrogated for "passive corruption", "illegal financing of an election campaign" and for "receiving public funds belonging to Libya under a false pretext". China Starts Striking Back ! 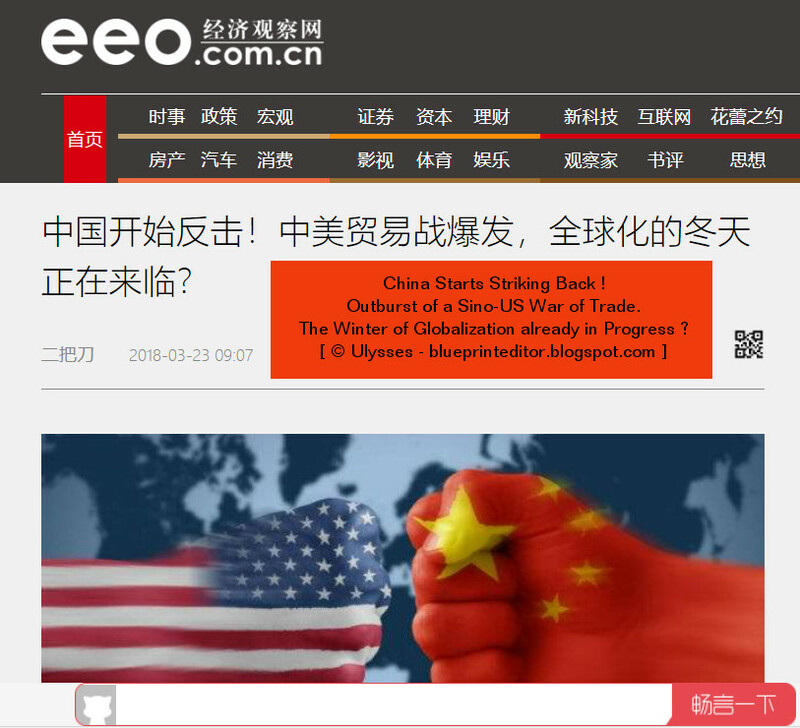 Outburst of a Sino-US War of Trade. The Winter of Globalization already in Progress ? Some hours later, China started striking back. At 7 o'clock in the morning China's trade ministry announced to target US import of steel and aluminium products by using 232 steps to suspend and reduce [the availability of] products [specially] requested by public opinion and contained on a detailed list that was drafted because of raised tariffs on part of products imported by the US. Balanced Chinese benefits would [otherwise] suffer from losses due to the raised US tariffs on steel and aluminium products. 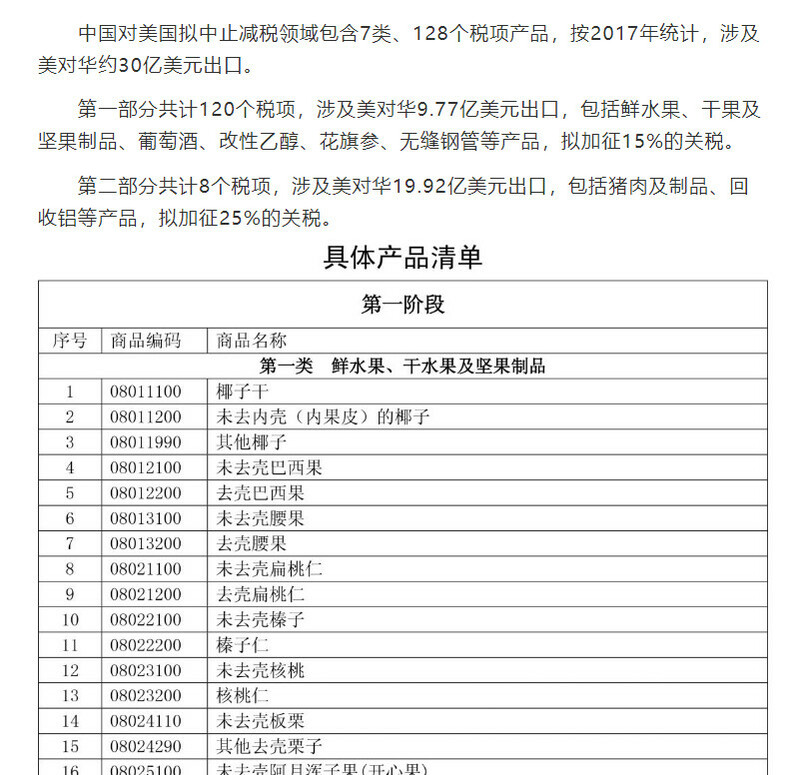 The [Chinese] list would temporarily contain 7 sorts of and 128 [single] taxed products. According to 2017 statistics, US exports to China make up for about 300 million US$. makes up for some 9.77 million US$. for some 19.92 million US$. A war of trade doesn't really hit ! China's economy "tsars" and America's [wealthy tycoons] agree to talks and a to [untie the knots]. 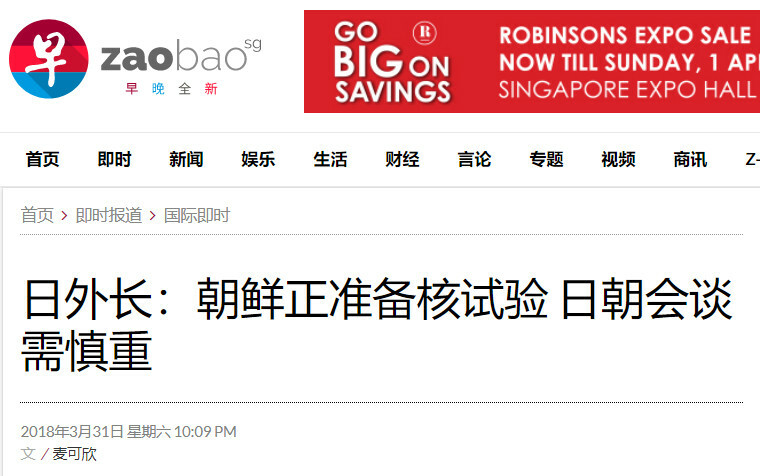 This brandnew video from a Hong Kong source is partly using cartoons to explain the disadvantages of a war of trade. It was published on March 24, 2018. 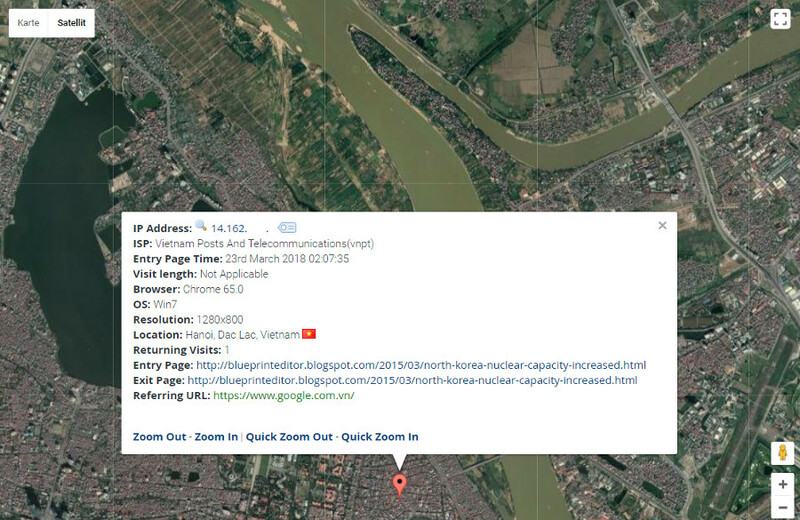 Visitor to "blueprint news" coming from Hanoi, Vietnam. N Korea - Chinese Wishful Thinking ? Yesterday, March 13, and on the occasion of his visit to Miramar naval base in S. California, US president Donald Trump expressed his hopes for an "outstanding" development in the North Korean issue. This refers to an eventual meeting between Trump and the N Korean leader Kim Jong-un before May 2018. It was the same day, Trump fired his foreign secretary, the rather moderate Rex Tillerson, and replaced him with CIA director Mike Pompeo, a notorious falcon when it comes to respond to North Korean aggression. 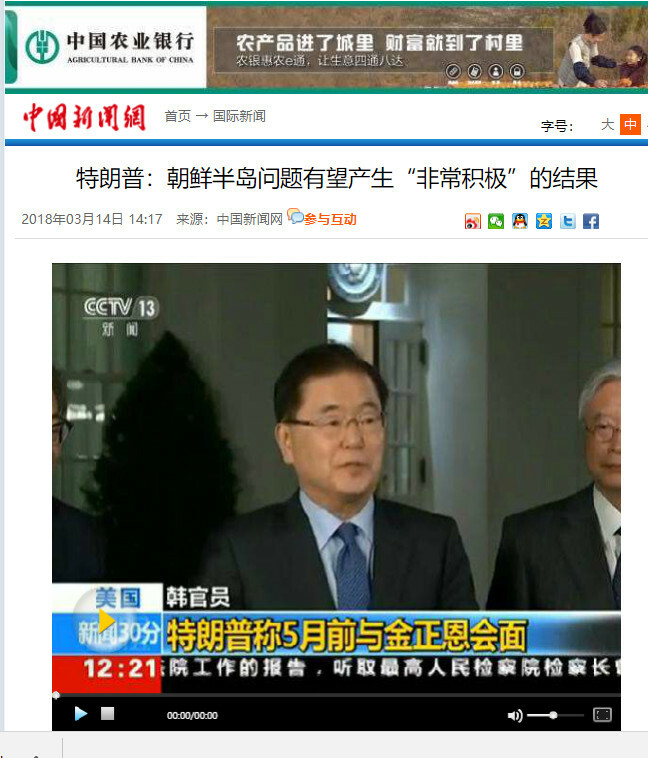 The Chinese source "China News Network", however, doesn't refer to such latest news from the White House and is quoting instead Trump's comment on the planned meeting with Kim, even one day after the US president made his widely unexpected move. Trump says he will meet with Kim Jong-un before May. hopefully deliver an "outstanding" result. US visitor to "blueprint news" reminding the end of World War II. 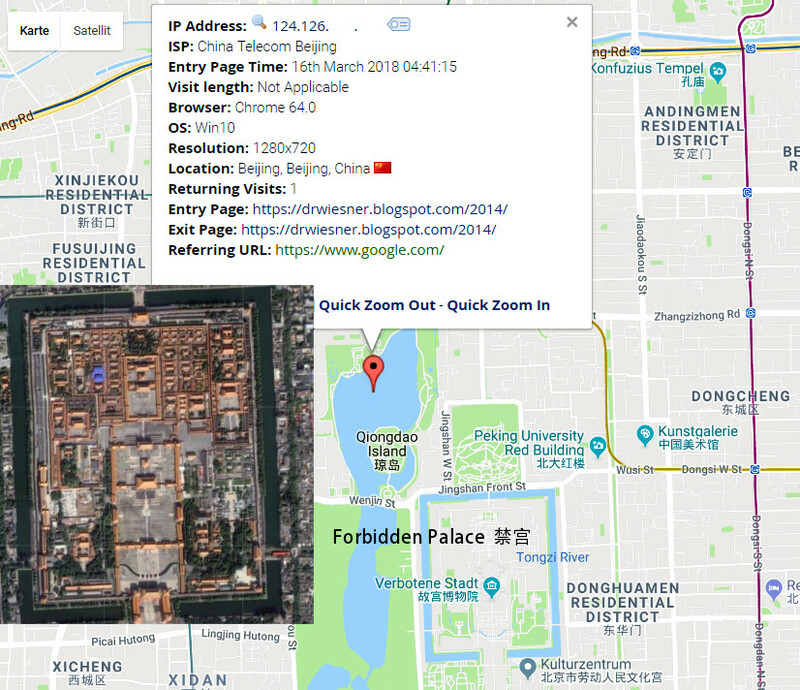 the internet could be detected in different parts of China in the past. Since tensions between Israel and Iran began to rise over the military presence of Iran and its regional ally Hezbollah in Syria, a war between both adversaries has become increasingly realistic. 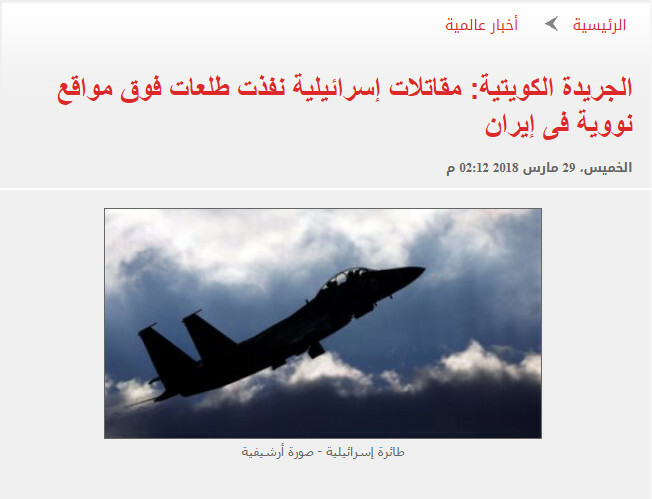 Newspaper: Joint US-Israeli strikes possible in Syria. A Kuwaiti newspaper said that Syria is now a target of imminent US-Israeli strikes and that its sources reported that Israel's prime minister Benjamin Netanyahu had discussed extended Israeli plannings with president Donald Trump during their meeting in Washington some days ago. 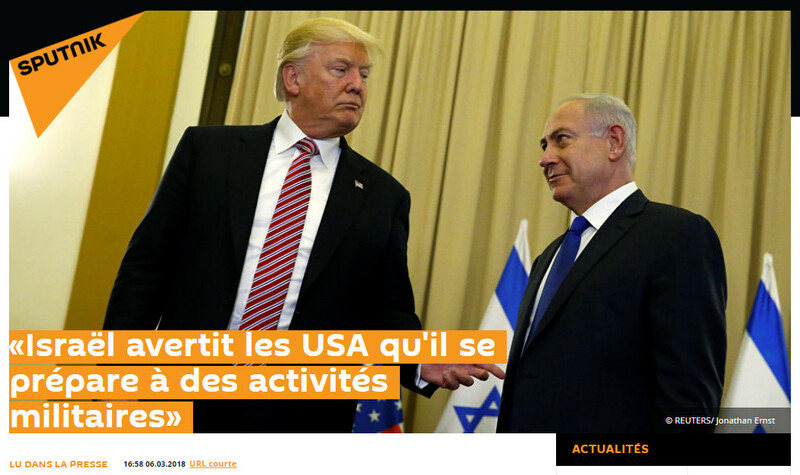 Sputnik on March 6, 2018: Israel notifies the US that it prepares for military activities. 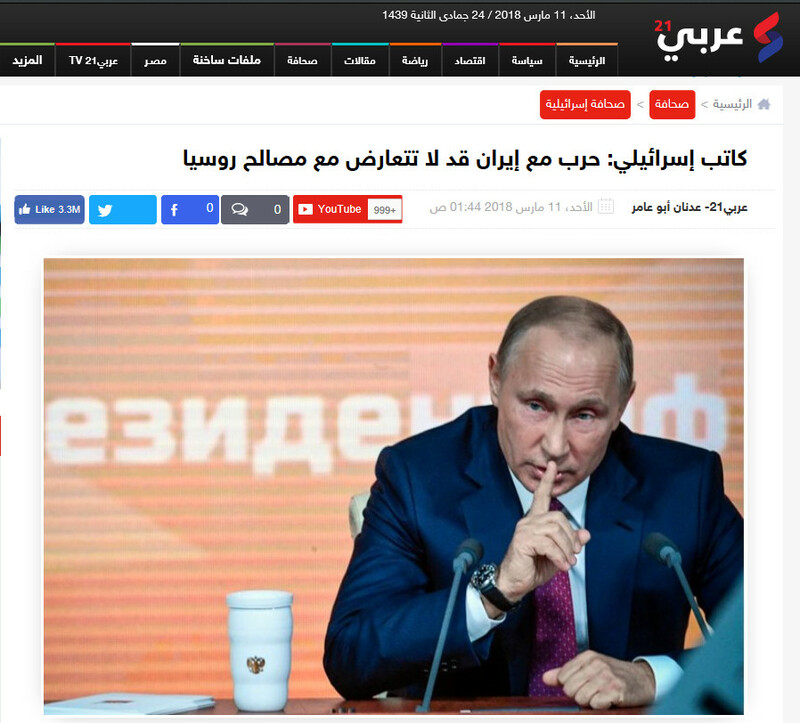 Israeli journalist: A war with Iran might not be in conflict with Russian interests. 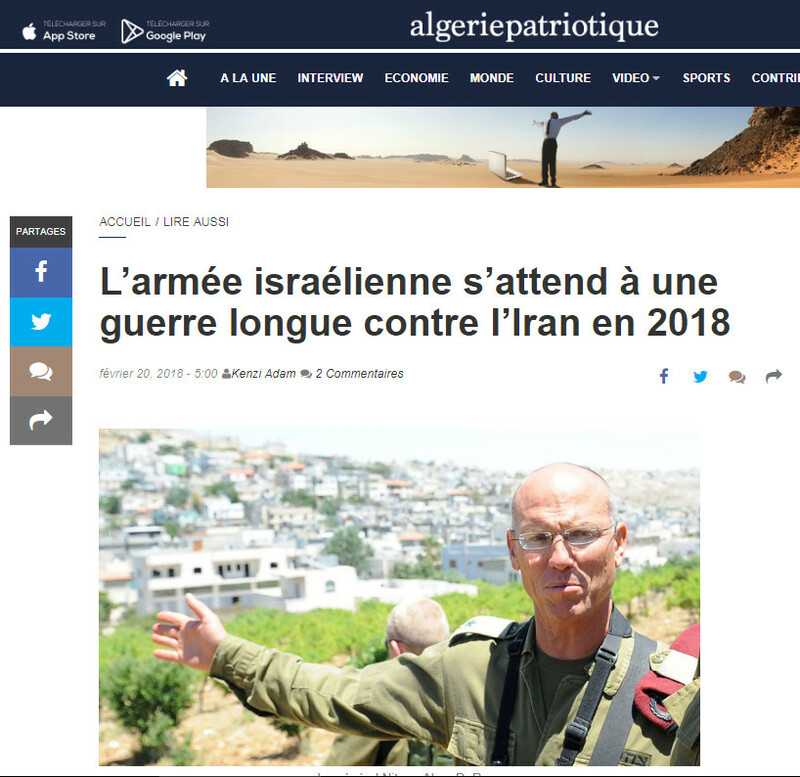 Israel's army is preparing for a long-standing war with Iran in 2018.
general Nitzan Alon (photo above), granted to the pro-Israeli website i24 News. Iran Preparing Showdown with Israel ? 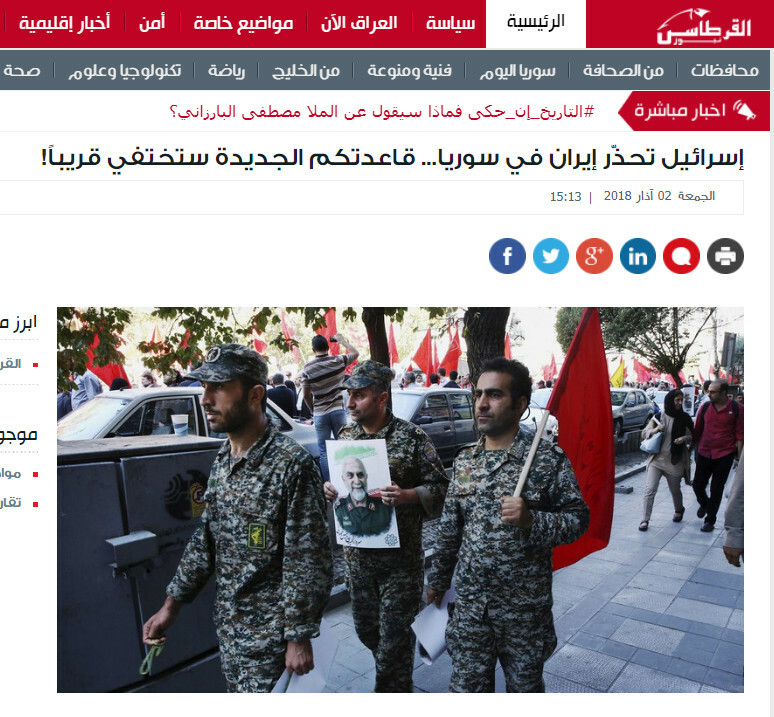 Iran stores rockets in Syria to hit all of Israel. 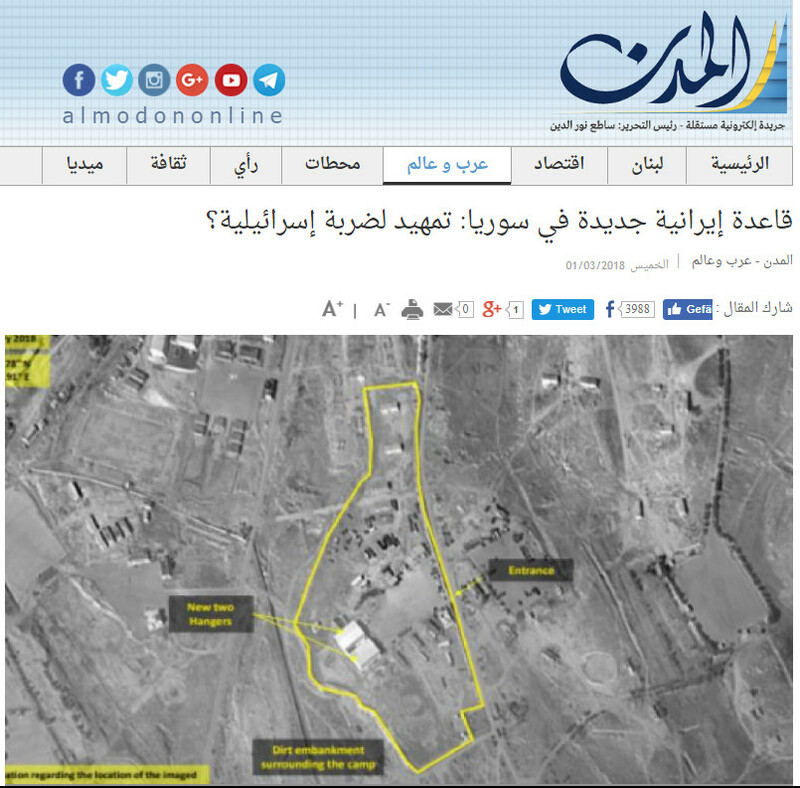 New Iranian base in Syria: Prelude of an Israeli attack ? Above photo: Iranian soldiers mourning their commander who lost his life in Syria. Israel warning Iran in Syria ... Your new base will soon disappear ! 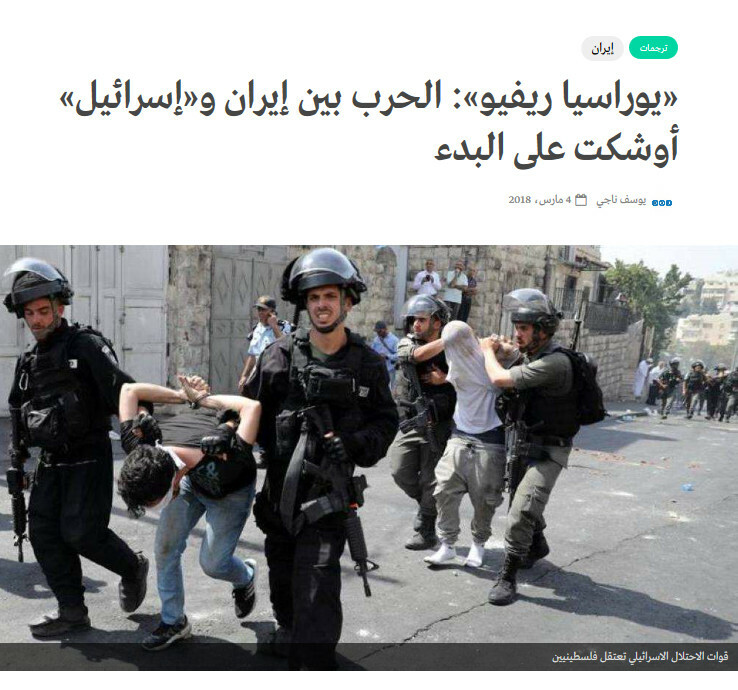 Above photo: Palestinian citizens being dragged away by Israeli Police. "Eurasia Review": The war between Iran and "Israel" is about to begin. Read here opinion from Israel In Syria Force Will Prevail, an article published by Haaretz on March 5, 2018. N Koreans Abroad - A Secret Army ? A US government report is stating that since help started in 2006 for those who escaped from the North with a refugee status, so far only up to 200 North Koreans have entered the USA. Chun Ki-won, however, a South Korean Christian minister from the establishment of church organizations assisting defectors from the North, showed that realistic numbers of people are much higher than this. Chun Ki-won said: " There are several thousand North Korean refugees emerging into the USA. The official number is 200, but a realistic number is rather near to 2.000 people. They are all illegal immigrants. The government neither knows who they are nor where they are. " He added that in the past 18 years he helped 1.100 people to escape from the North and to settle in Europe, Asia and America. In the case of America the refugee group from the North is living in Washington DC, Chicago, New York and Los Angeles. In 2016, Thae Yong-ho, a former counsellor at the North Korean embassy in Britain, defected to South Korea, [on that occasion] warning national leaders: Beware of a desperate attack launched by Kim Jong-un. In an interview granted to the US national broadcaster NBC in 2017, Thae Yong-ho said: If Kim Jong-un is in the possession of nuclear weapons and intercontinental ballistic missiles, [he can do whatever he wants]. He said: Kim Jong-un is somebody who could do anything beyond the imagination of normal people. On February 23, US president Trump announced the largest list of sanctions in history against North Korea and which included 27 shipping and trading companies, 33 vessels, as well as Taiwan businessman Tsang Yung Yuan. The US submitted that list to the UN Security Council, but met with China successfully blocking the approach.